KHUZAA, Gaza Strip — Thousands of Palestinians, including hundreds of medical workers in white uniforms, took part Saturday in the funeral procession of a colleague who was shot dead by Israeli troops the previous day along the Israel-Gaza border. Relatives say 21-year-old Razan Najjar was a volunteer paramedic who had helped evacuate and treat the wounded during weeks of cross-border violence. She is just the second female fatality out of more than 115 killed since the deadly border protest campaign began in late March. Later Saturday, in a development that threatens to collapse an informal cease-fire, the Israeli military said two projectiles were fired from Gaza. One was intercepted by the Iron Dome defense system and the other landed inside Gaza. Earlier this week, Gaza militants fired a large barrage at Israel, which responded with heavy strikes against Gaza installations. Meanwhile, in the West Bank, the Israeli military said its troops shot dead a Palestinian who tried to ram a tractor into its forces. The military said its initial investigation revealed that a 35-year-old Palestinian from a village near Hebron tried to run over an officer with a Bobcat tractor. The attacker then turned around and tried to attack nearby Israeli civilians, the military said. It said a soldier opened fire, killing the assailant. No Israeli troops were harmed. Since 2015, Palestinians have killed over 50 Israelis, two visiting Americans and a British tourist in stabbings, shootings and car-ramming attacks. Over 260 Palestinians were killed by Israeli forces in that time. 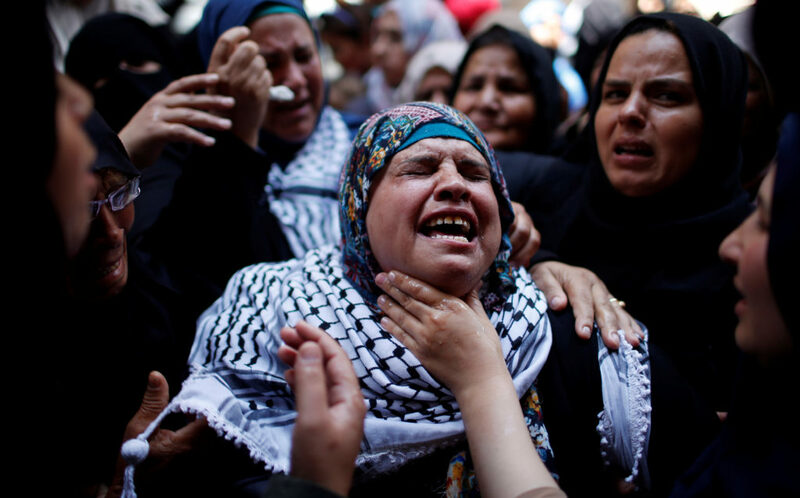 Israel says most were attackers. The attacks have petered off in recent months as the Palestinian focus has shifted toward mass protests at the Gaza border. On Friday, the Palestinians protested for the 10th week in a row. The military said some hurled grenades and pipe bombs at troops behind the security fence. Some 40 Palestinians were wounded and Najjar was the only one killed. The military said its troops operated “in accordance with standard operating procedures” and that it was investigating the incident. Israel insists that throughout the weeks-long campaign it has only opened fire at instigators and that Hamas has been cynically using the demonstrations as cover to carry out attacks. On Saturday, the military said it thwarted a Palestinian attempt to damage the security fence surrounding Gaza and a group of militants briefly entered Israel before fleeing back into Gaza when Israeli troops opened fire. However, Palestinians and human rights groups have accused Israeli forces of using excessive force on some occasions, and of killing Palestinians who did not pose an imminent threat both in the West Bank and Gaza. 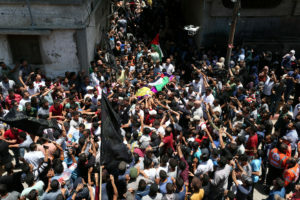 Najjar’s body was wrapped in a Palestinian flag as the funeral procession started from the hospital and passed near her home in Khuzaa, a village near the Khan Younis that is close to the border and has served as one of five protest encampments across Gaza in recent weeks. She was the eldest of six siblings. On May 14, when the protests peaked over the opening of the U.S. embassy in Jerusalem, a 14-year-old girl, Wessal Sheikh Khalil, was the first female protesters to be shot dead. She was among more than 60 people killed that day, the deadliest since a war between Hamas and Israel ended in 2014. The Gaza protests are being organized by the territory’s militant Hamas leadership and are aimed at drawing attention to the decade-long Israeli-Egyptian blockade on the territory. The protesters are also demanding the “right of return” for Palestinian refugees from the 1948 war and their descendants. Al-Mezan, a Gaza-based rights group, said Najjar was 100 meters from the fence and wearing a clearly marked paramedic’s vest when she was shot. Social media videos, and one captured by Associated Press footage, showed Najjar and a cohort of medics walking toward the fence and raising their hands to reach a wounded man lying on the ground. Najjar wore a dark blue headscarf and a white coat with the logo of the Palestinian Medical Relief Society, where she volunteered. “She helped all people. She has never refused to help. She was the first to run toward anybody when he is shot,” he said in tears.